India's top selling series. 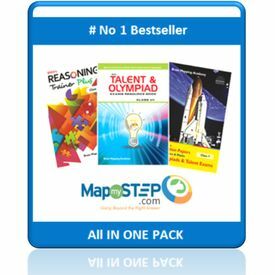 Excellent source of important concepts and objective questions for Mathematics and Science Olympiads/ NTSE / NSTSE /SLSTSE. Scholarship Tests and other National and State competitive examinations. Separate book for each class, Prepared on curriculum-based classroom content for CBSE/ICSE/Board of Secondary Education of all the states. Mathematics, Physics, Chemistry and Biology are covered in this single edition. Fundamental concepts are thoroughly revised. Exhaustive range of questions that stimulate and test the student's knowledge. Application / Skill / Knowledge / Understanding oriented questions. Solutions and explanations for challenging questions.